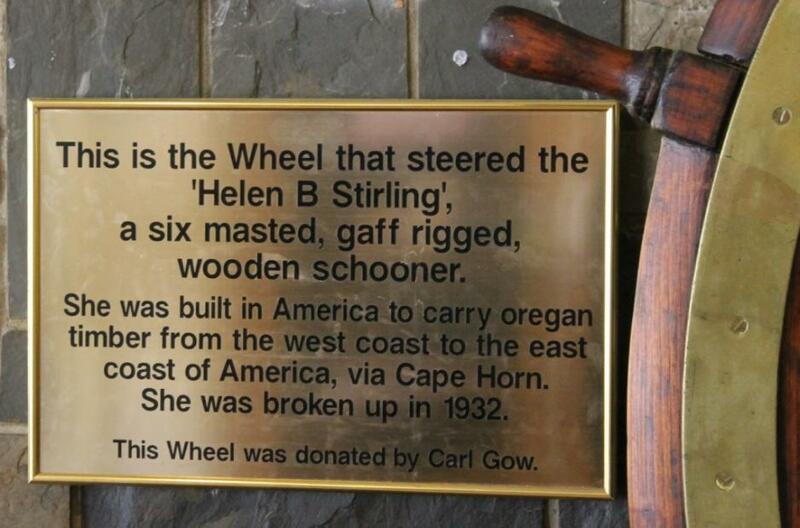 In the foyer of Club Palm Beach (formerly Palm Beach RSL) is the large ship's wheel donated by Carl Gow, Palm Beach legend and former lighthouse keeper at Barrenjoey, of the six-masted schooner the Helen B Stirling (sometimes spelt 'Sterling'). There were two sailing ships of this name. The first was a four mast schooner which foundered in 1922 near Three Kings off New Zealand. This Helen B Sterling was built as a four-mast wooden auxiliary screw schooner, a windjammer, of 1608 tons, and formerly known as the ‘Tacoma’, by the Washington Shipping Corporation in Seattle in 1917. The dimensions of this vessel were: Length: 220 ft. Breadth: 43 ft. Depth: 21 ft. This original Helen B Sterling was wrecked and sunk in this storm which second generation relatives of those who were passengers state was more like a cyclone. (1). The second Helen B Stirling, from which this ship's wheel came., courtesy State Library of Victoria, image no: 230169. The second ship of this name was a six-masted schooner purchased by Ray Milton Sterling (E R Sterling’s son) in 1926 (she was originally the OREGON FIR and was rejigged). She was named after his mother. Her dimensions were approximately 267.0 feet (81.4 m) in length, 46.5 feet (15.3 m) breadth and 25.2 feet (7.7m) depth and she was a 2526-ton (gross) ship, alike her sister ship the Dorothy H Sterling. (3). The Dorothy H was named for Captain E R Sterling’s daughter. Both these vessels were built at Portland, USA, by the Peninsula Shipbuilding Company of Portland, Oregon, USA and were not only the largest of their kind to be built then but also among the most expensive, costing £50,000 to build. The Sterlings were an American shipping family. Patriarch Captain Edward Robert Sterling, Canadian born, and his wife Helen B Sterling, plied the timber trade between America, Australia and New Zealand. They had three children, Ray Milton Sterling, Ethel Manila Sterling and Dorothy H Sterling. They were E R Sterling & Company Inc. and came into possession of these large schooners after both met with mishaps elsewhere and their repair bills could not be met. Son Ray married Ethel May Francis, born on 17 March 1894 in Hamilton, Newcastle NSW, on 17 December 1916 at St Peters Church in her hometown of Hamilton. Two years later, their daughter Margaret Francis Sterling was born on 8 August, and within three months, records indicate that Mrs Sterling sailed to San Francisco with her daughter on the VENTURA. In the US, the couple lived in Seattle, Washington with Ray Sterling's parents, Captain E R Sterling and Helen B Sterling. Ray Sterling was captain of the six-masted barquentine E R STERLING throughout his career following his father's footsteps. E R STERLING was originally built in Belfast in 1883 as a four-masted iron ship LORD WOLSELEY. In 1904 it was renamed EVERETT G GRIGGS and modified into a six-masted barquentine. It was sold and renamed E R STERLING in 1910, and was broken up in 1927. Picture: A 1925 picture of Ethel May Francis and daughter Margaret Francis beside the E R Sterling wheel; also ten spokes. Image Courtesy The Australian National Maritime Museum, Image: 00035539 taken by Samuel J. Hood Studio Collection; ANMM states before he made his way into photojournalism he would take his Folmer & Schwing Graflex camera to Sydney Harbour and make an income from photographing Captains and their families and their ships as portraits and studies of these vessels on Sydney and Newcastle Harbour. He also photographed many Pittwater Regattas once employed by SMH in the 1930's. Fortunately and thanks to Carl Gow, Club Palm Beach, Pittwater people and visitors can look at and touch this wheel from Maritime History and be in the presence of those who sailed in her and the times of prosperity that were cut short by the fiscal strangling the Great Depression was for so many sea-faring entrepreneurs. Above: A schematic animated drawing of the workings of a traditional ship's wheel and tiller showing a series of pulleys and sheaves. Created by and courtesy of KDS444 November 2012. Heleln B Stirling Wheel at Palm Beach RSL by A J Guesdon, 2013.